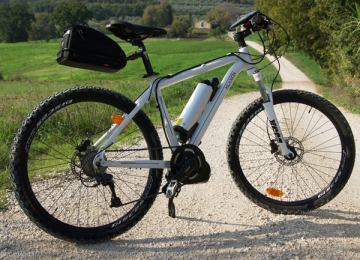 The e-bikes are available in 2 different sizes (medium and large), so as to fit perfectly any rider. They are equipped with a comfortable gel seat providing the best comfort during an entire day. The e-bikes, manufactured by the Italian company KLAXON, are equipped with a battery powered central motor (which accounts for higher bike performance and steadiness). The battery is replaced by our service staff halfway along the route. Using an e-Bike of this type does not deprive the traveller of the bike riding experience, nor does it lessen the need to push the pedals to move forward. 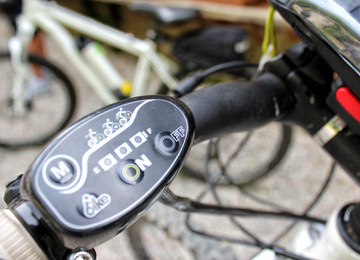 The 3 pedal-assist modes of the motor provide a feeling of lightness, minimum effort and more power during every single riding phase, particularly when setting off or when riding uphill. Every itinerary is preceded by a briefing made by our Staff, that allows to gradually gain confidence and to quickly learn how to use this extraordinary means of transport in the best way possible!